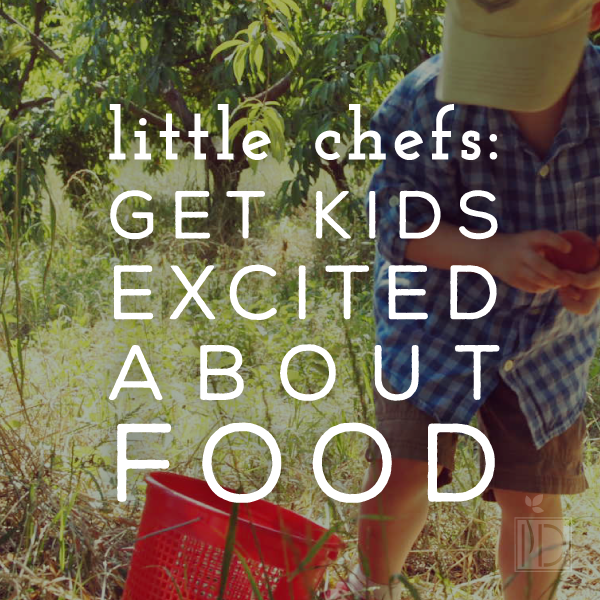 When I was a hustling farmers’ market chef in Nashville, my kids were by default my sous-chefs. With dad away at training, school, or work, I had to incorporate the boys into any activities I pursued. It was an adventure really. They learned the names of all the farmers, cheese makers, and the tortilla lady. My oldest even inspired a children’s book series, The Adventures of Little Chef that’s still in progress. The irony is that the older they get, and the more work I take on, I have leaned on another part of our family for assistance - the electronic video game. It hurts to admit. Not to jump in the ring of the video game debate but you know…the look from elder generations when we ‘pacify’ our young ones with handheld devices suggesting, “When you were kids, we gave you crayons, and you were happy.” And begrudgingly I agree because I limit the games or apps to only something I think will, hopefully, encourage their creativity and not just numb their minds. Still, I pack mini art kits for restaurants, road trips and doctors’ appointments but sometimes - all that will do (at least to get the level of quiet I seek) is the games. Recently, I have noticed a decline in the engagement of my own Little Chefs in the food-making process. Maybe it’s the last few weeks of moving into our new home from our first PCS and the time it’s taken to get acquainted with famers markets in town. Whatever the case, I can tell a difference when I limit the access to the games - especially anytime near a trip to market, grocery store, or food preparation. Based on my experience, the foundation of getting kids interested in food is letting them be a primary part of the food-making process. This is, what I have known to be true as advising parents previously, the foundation of getting kids interested in food. Making them part of the process, or rather allowing them to be a primary part of the process. Engage with “I Spy” or landmark games en route to the farmers’ market, grocery store, or a farm trip. Who can spot the sign first? How do you know when we are close? What do you want to pick from the farm? Who wants to choose our veggie side for dinner? This opens the mind to the possibilities of food and hopefully takes away the need for pacifying and connects the parents and kids to make finding food an adventure. The same goes for the time at your destination. Do your Little Chefs feel like they “have to” be there for something you want or because they “get to” make some decisions about what the family eats. If you have a less adventurous eater, start small and offer choices to narrow it down. Introduce milder foods like sweet potatoes, bibb lettuce, or yellow squash can be mild in flavor rather than more bitter foods like turnips or romaine lettuce. This week we visited a new farm just outside the gates of Fort Rucker, and without my prodding the kids asked Farmer Bobby if they could pick peaches instead of getting them at the farm store. Later that evening they asked for a peach snack. “How about a peach taco? !” Great idea. Try this recipe for your Little Chef today. 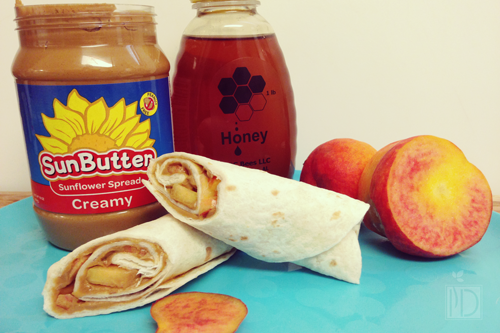 Spread sunflower seed butter on tortilla, lay out peach slices, add honey, roll and enjoy. For fun presentation after rolling, slice on a diagonal so you can see the layers. Little Chefs can assist with: Getting out supplies, washing the peaches, spreading the seed/nut butter, rolling into a burrito or folding like a taco, and squeezing the honey bottle.